A challenging circuit route traversing the Kelly Range and returning along Kelly's Creek. The direction described is the easiest option. The open spaces and easy walking of the Kelly Range contrast with the rough travel on the creek below, providing an interesting weekend circuit. Hunts Creek Hut • By ledge. From the car park and camping area at Kelly's Creek, follow the trail to Carroll Hut. The track climbs steeply through forest for about an hour before easing and then entering scrub after 2 hours. 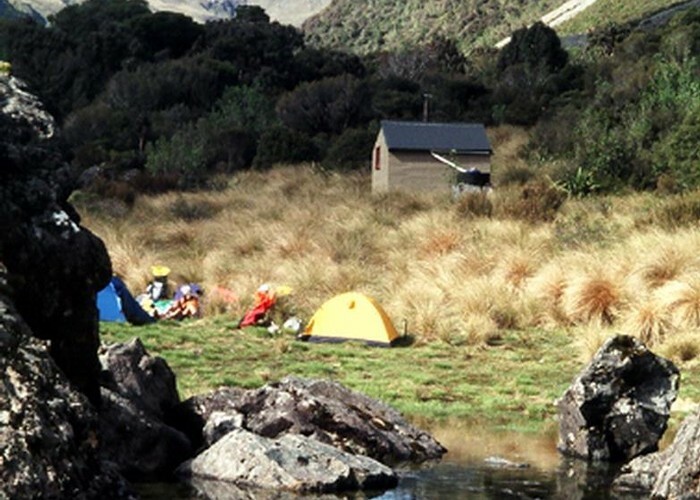 The hut is located on a handsome tussock plateau. 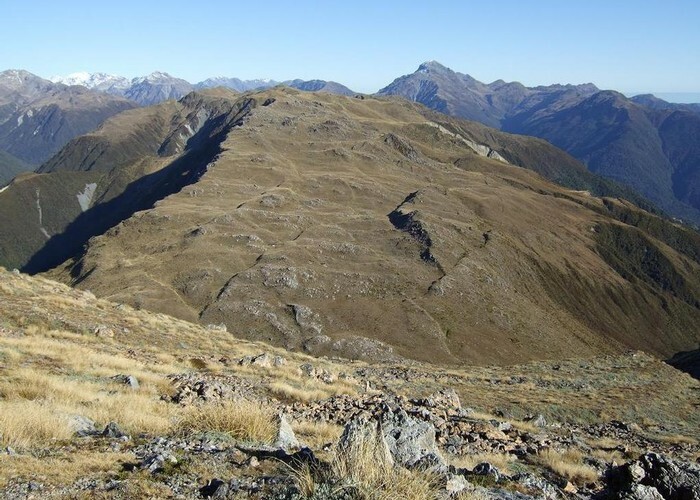 From here, follow the track up to the tarns at Kelly Saddle (1165m) and head left (to the southwest) along the range. The walking is a gentle ascent, and easy going. From the end of the range, follow a rocky gut down toward the northern of two tarns marked on the map (BV20 772 585). At the head of the tarn a track has been lightly cut and marked to head up steeply to the ridge above. Travel a hundred metres up this small ridge and descend via a track that eventually follows an open water course to a short section of tussock at the head of the lower tarn (BV20 773 583), then continue southeast via a permolatted track to the swampy area (BV20 777 581). If you miss this route, then you will need to struggle through thick and unpleasant muttonbird scrub and mountain neinei for an hour or two: make your way toward the swampy area. From the swamp, follow the creek eastward and down. A permolatted track starts on the true left but soon enters the creek before crossing it a few times. After 20 minutes, you will reach the Kelly's Creek Track. If you are heading to Hunts Hut, turn right and follow the trail over Hunts Saddle. The saddle is hard to navigate, being muddy and covered with head-high tussocks. Look for marker poles and watch out for deep holes. A very rough track continues in forest, climbing and falling regularly. The forest here is dominated by handsome (and in some cases very large) mountain nei nei. The track crosses the first of two large screes 20 minutes before the hut. 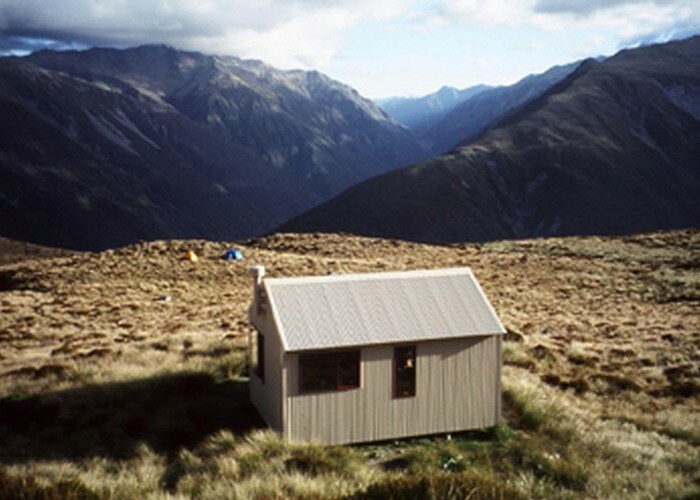 The hut is located at the edge of a tussock clearing. From Hunts Hut, return to Hunts Saddle. From here, an easy track heads through light forest for a while before the track crosses a slip and becomes very vague. From here on, travel is in the rough riverbed with brief marked sections that are often best regarded as high water tracks. The route remains on the true left all the way to the car park. A lower, remarkably steep section of track climbs well above the river to avoid a gorge section and crosses two swift creeks. Kellys Range & beyond from Kellys Hill July 2011 • By glennj. Licence: C.
Added 29 January 2006 by MatthewMatthew. 7 revisions, most recently 27 December 2017 by HonoraHonora.